On the occasion of a business exchange between teachers from Hanoi - Amsterdam High School for the Gifted and Louis-Le-Grand High School (Paris, France), a seminar hosted by our beloved foreign teachers took place in Hall 100, on the afternoon of February 25, in the presence of students majoring in French in Hanoi - Amsterdam High School for the Gifted, who actively participated to create a lively and stimulating atmosphere. An overview of the meeting with the beloved foreign teachers. The session kicked off with the introduction of Louis-Le-Grand High School’s historical heritage, which is followed by an overview of the majors and courses available at this school. Thanks to this, the students have been able to have a closer look at the French educational system in general, and at Louis-Le-Grand High School in particular. Louis-Le-Grand is a reputed and prestigious high school in Paris (France). Founded in the 16th century under the name of Collège de Clermont, the school plays an important role in France’s educational system, in addition to being noted for successfully nurturing talents with its strict admission procedures and its highly appreciated educational standards. In the exchange session, the teachers also give our students some useful advice on preparation and its necessity as a way to avert future confusion and make informed decisions regarding aspirations in the near future. While Vuong Ha My (10 French 2) expressed her desire to specialize in the field of Culturology-Sociology or other commonly chosen majors, Nguyen Anh Duong (12 French 2) voiced her questions regarding tuition fee and legislative procedures of studing overseas. Their inquiries were similar to the majority of the other students and were answered and explained thoroughly by the dedicated French teachers. 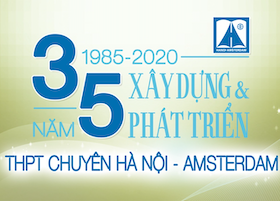 The session provided the students of Hanoi - Amsterdam High School for the Gifted majoring in French with much useful advice which can be of immense benefit to their futures. We’d like to express our gratitude towards the teachers of Louis-Le-Grand High School for spending their time in Vietnam to talk, orient and inspire the students themselves. The teachers really were a source of immense inspiration and incentive for those wanting to study abroad.